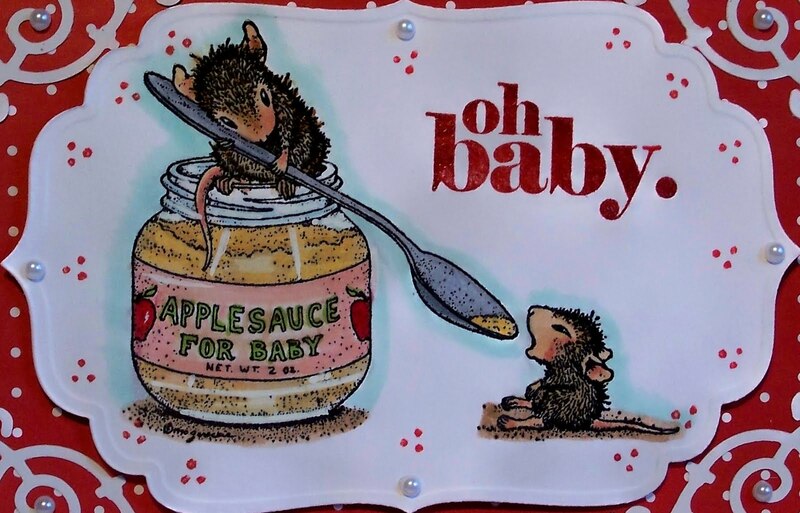 Close up of the adorable baby mouse being fed Baby food by his Mom! I used the House Mouse Design Stamp to create my card this month. They are sponsoring the challenge and offering up a $ 15 shopping spree at their online store. I used a lime green polka dot paper for the main card and red polka dot mat for my Spellbinder's label die. I colored with Copics. The corners are a Sizzix die. Kaiser pearls, Martha Stewart border punch. Red polka dot ribbon bow finishes it off. The sentiment is a dollar stamp. Hope you get a chance to join us for our month long challenge at Fuzzy Wuzzy for May. You have until the 31st to enter a card, and you might want to check out the beautiful cards our design team has come up with for some inspiration. Sooooooooo cute!!!!! I love the colour contrast and the white shapes along with your fabulous colouring!! What an adorably sweet image, those HM stamps just get cuter and cuter, and so does that shirtless fella beneath this project, lol!!! I'm blushing!!! Thanks for supplying us with such stunning inspiration!! he is cute and your card is very lovely sue. This is super cute, Sue! I love the green and red together! That image is so adorable! Great card! This is incredibly cute Sue! Love those papers and your amazing colouration of this cuter than cute stamp! Sue, This is a terribly cute image and the green and red are great and not a bit christmasy. What a sweet image. Just love it. WOW!!! INCREDIBLE design, gorgeous colors and combo of elements.BEAUTIFUl HM work my friend. :) LOVE IT!! I swear they make mice darling. Wish they could be that cute in person. Oh Sue, this is just the cutest! Love all the red, my fave color!